Australia’s longest operating fitness business consultants has partnered with the world leaders in personal training business coaching in what will be an exciting relationship for clients of both companies. 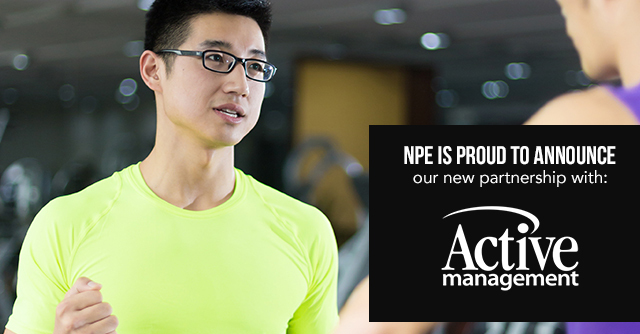 Starting July 2016, Active Management will be partnering with NPE as they work together to help personal training businesses get stronger. For over a decade, Active Management has been offering business coaching for personal training businesses in their suite of products. In 2016, they released an upgraded online membership for fitness businesses and are rapidly growing the online community of fitness business owners to be the largest on the planet. “Every month we deliver five resources for our international members. That’s a lot of content to deliver and that is where we want our energy. Our core business is not coaching personal training business owners, and we know people in our community want this service. After researching for over a year, we have decided to work exclusively with NPE,” said Tamsett. In 2006, Sean Greeley founded NPE – the only global fitness community that empowers entrepreneurs at every stage of business growth and development through education, coaching, and access to a community of like-minded professionals. Over the past 10 years, they’ve helped over 21,000 fitness business entrepreneurs in 95 countries grow their businesses, achieve their goals, and live their dreams to create a better life for themselves and their families. “Fitness businesses will be the winners from this partnership,” said Tamsett.